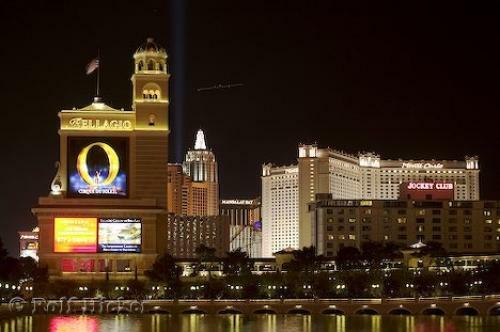 The billboard at the entrance to Bellagio Hotel and Casino in Las Vegas, Nevada, USA. Water, fountains, and gardens are a trademark of the Bellagio Hotel situated along the Las Vegas Strip in Nevada, USA. There are many resort hotels to choose from when planning a visit to Las Vegas, and the Bellagio Hotel and Casino can to satisfy your every fantasy of a Las Vegas vacation. Bellagio Hotel and Casino, Las Vegas, Nevada, USA, North America. along the Las Vegas Strip, Nevada, USA.